← Should I Do an Edited Collection? Dr. Karen is on vacation July 2012. During that time she is re-posting older blog posts her regular Tuesday and Thursday posting days. She’ll recommence new posting some time in August. I read a Career Advice column in Inside Higher Ed this past month that I loved. It is called “The Value of Self-Promotion,” and it’s written by Rachel Connelly and Kristen Ghodsee. Rachel Connelly is the Bion R. Cram Professor of Economics at Bowdoin College. Kristen Ghodsee is the John S. Osterwies Associate Professor of Gender and Women’s Studies at Bowdoin. So these women are no slackers. Clearly they know their way around the academy. Hear, hear! They go on. Really, I love these guys. Did I mention I love these guys? Especially because their advice is explicitly directed at women. The column is actually adapted from their new book Professor Mommy: Finding Work-Family Balance in Academia (Rowman and Littlefield). Because women are the worst (this is me talking, not them) at self-promotion! Women far too often sit back and wait to be noticed. They fret endlessly about seeming “arrogant” or “pushy.” I’m here to tell you that pushy is good. You have to toot your own horn, and put yourself out there. They also make a point of reminding you that you were also conscious to cite all influential scholars in your specific area of focus in your bibliography. Well, that released the wolves. Sort of. Actually, they didn’t get a lot of comments (and two of them are by me, telling them how great I think they are!). But most of what they did was negative in that particular superior,elitist, judgmental professorial tone that we all know so well. The advice — writing senior people and possibly lying about how useful you found their work, and referencing their work “even if their work is tangential to your own” for networking purposes — is unprofessional and unethical advice. …These games should be replaced by honest, well done scholarship and true dedication to professionalism — that is what will impress senior people; otherwise the academic profession will continue to slide into a Wall Mart mentality. …I am disheartened to read two scholars who advocate such anti-academic ploys — referencing work even if it is tangential to your own, just to ‘show what you’ve read, even if it contributes nothing to your argument? referencing senior scholars’ work just to ‘make friends’ with them? Is this a joke? Do you really think that anyone would not see this for that it is – shameless self-promotion without regard to intellectual quality? What many of these readers are responding to, Rachel and Kristen, is the slight note of insincerity in your article. While the advice is generally useful, following it for no other purpose than professional advancement is going to backfire on the junior scholar. We’re not dummies, after all. If you give more professional advice in future columns, I suggest you justify it by addressing WHY and HOW your advice advances academe as a whole rather than the careers of a select and cynical few who are willing to game the system. I bolded terms in each comment because to me they perfectly encapsulate the gap between the old, obsolete mind-set, and the new one required under current market conditions. I want to pause here and say that when I was training my own Ph.D. students, I always advised them to do precisely what the authors are recommending here. (And just fyi, my students are all [with the exception of one who chose a different career path] gainfully employed in academia). I also did this practice myself throughout my career. And I was on the receiving end of such off-prints many times. I found these small academic gifts, with a personal note, a lovely gesture. The senders were in or close to my field, and the kinship with my work was clear. In many cases I would not have found the piece on my own, so having the off-print was helpful. Why do I believe this practice is effective? First, because of the very reason the authors speak of. Self-promotion is absolutely necessary. Great thoughts will do you little good if nobody knows about them. You cannot afford to sit passively and wait for people to find you. And posting things on your website is a POOR substitute! Senior scholars do not have time to go hanging about the internet! The website is really a relatively ineffective self-promotion tool for a young scholar seeking a job or tenure, and very time consuming to develop. No, senior scholars are usually very paper-centric, still. Send them paper and a note. It works. Second, this is one of the finest methods available for starting to collect your stable of potential tenure letter writers. You cannot have explicitly collaborated with your future letter writers. You can’t have been colleagues or friends. But you want to make sure that you have a collection of 6-10 people who are broadly familiar with your work and impressed enough with you to write the superlatives you need for tenure. Sharing of your work is an excellent method of beginning that process. Now, to the comments and their obsolete mind-set. The Professor believes that it is criminal when tenured faculty members admonish junior people and job-seekers against using every means available to promote themselves and their work. 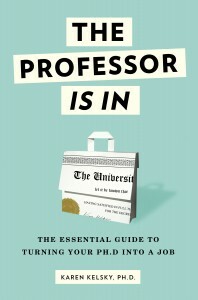 The Professor believes that it is criminal when professors suggest, in this day and age, that a job- or tenure- seeker’s primary task is to “advance academe as a whole” rather than their own careers. A comment stream is one thing. But the advising that takes place in professors’ offices across the country is another. And far, far too common in those offices is the attitude of the commenters above. In imposing this obsolete and irresponsible world-view, these professors are handicapping their advisees and practically guaranteeing that they finish their Ph.D. without job or career. I was shocked, infuriated, and disappointed. And also confused. Why would I not prefer the highest ranking, highest paid, most prestigious, most generously supported job I could get? The job with generous built-in leave time? The job with a mortgage subsidy? Why would anyone not set out to get that? I was thrilled with the tenure track offer that I had, of course, but why would I not also grieve what might have been? That exchange stayed with me, and rankles me still. It was in the 1990s, when things were already REALLY bad on the market, although nothing compared to today. And he was wrong. The commenters I quote above are wrong. It is not gamesmanship or careerism to want and go after the best job you can get. Promote yourself. And don’t look back. A friend recommended your website/blog to me. Your perspective is refreshing and very much needed! I like everything you say in this post. I’m nearing my dissertation defense and have three main mentors I have been closely working with, all senior, fairly well-known white men. Those three explicitly frown on the self-promotion game. More generally, I’ve been in graduate school for seven years (M.A. degree, plus my current Ph.D program), but I have *never* met a faculty member who gave me a point-by-point career advice, similar to the one you outlined in the post above. Our job placement adviser meets one-on-one with those who are currently on the market and basically gives advice on CV font size. But nothing less (barring being a genius) than a well-thought through strategy is going to work in this market. My sense is that the senior people are particularly out of the loop on this point. One of my advisers tells me that my barely average (productivity-wise) CV looks stunning compared to his CV when he went on the market 30 years ago; he then goes on to predict great success (for me) on the market. Why are so many professors out of the loop when it comes to giving reasonable advice for one’s career path? My CV would have looked very different had I been more pro-active and, yes, selfishly self-directed. Re self promotion, it just depends how you do it. I can’t abide the people who fawn and kiss up – well I mean, I don’t begrudge them this but I am not comfortable doing it and won’t. But then I’m a *true* extrovert: unafraid to make cold calls, introduce myself to people I find interesting, send people offprints etc., invite famous people to conference panels. Then it’s not “gaming the system,” it’s just working. That’s not extroversion, either–it’s just assertiveness. I’m a strong introvert but manage to do all those things, except for the reprint one. I really don’t see people (senior PIs included) reading hard copies anymore. I email them. Thanks for this. Does the handwritten note need to be on letterhead? it doesn’t have to be. It looks nice when it is, but I’ve gotten them where the note is simply written up in the upper margin of the article, or on a post-it note, and those are fine too. Would this still be worth doing if you disagreed with the senior scholar in your work? what a great question! very tricky. It depends on how hard you disagree, the tone of your disagreement in the piece (is it thoughtful and respectful or harsh and dismissive?) and what you know of the individual. Some love to be in an argument, and some will rise up in fury. Judge the conditions and make a choice. If the tone of your disagreement is harsh, and/or the individual is known to be retaliatory then no, don’t send it. Thanks for more great advice. Would it be appropriate to include your personal web site, or to say a little about yourself, or current job situation? Perhaps the gesture is enough and additional comments would be perceived as over-the-top.. I am an entering graduate student. I wrote a decent paper for an upper division undergraduate course. Subsequently, it was published in the inaugural issue* of an online journal* (with, therefore, zero reputation*). Is it acceptable to send an “offprint” of this article to the 2 major academics I cited? The work is fine, but I wonder about the caliber of the publication. *Obviously a silly choice in retrospect. **The online journal is peer-reviewed. yes, send it. For youngsters such as yourself, any publication is impressive. Just don’t make that mistake again. Pingback: Quick Tip: Share with Someone Who Needs to Know You’re Great | Brandy A. Brown, Ph.D. I know this post is really old, but I hope you can still answer! When you say ‘paper copy’ do you mean a printout of the PDF or do I need to buy copies of the journals and cut the pages out? when you publish articles, they usually send you a certain number of pre-printed copies of your articles, which are called “offprints.” otherwise, just get the pdf of your article and print that out.